When materials like silk or polythene become charged with static electricity it is because they are poor conductors or insulators and the electrons stay on the surface. 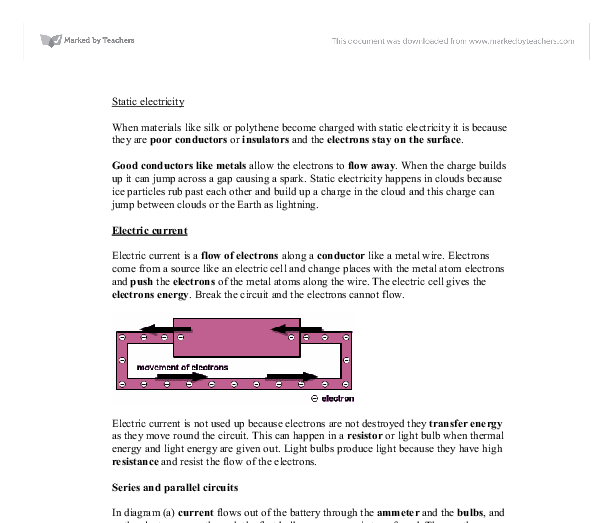 Good conductors like metals allow the electrons to flow away. When the charge builds up it can jump across a gap causing a spark. Static electricity happens in clouds because ice particles rub past each other and build up a charge in the cloud and this charge can jump between clouds or the Earth as lightning. 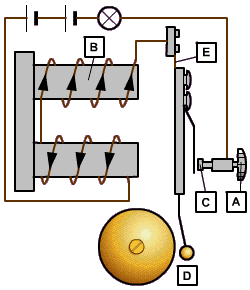 In diagram (a) current flows out of the battery through the ammeter and the bulbs, and as the electrons pass through the first bulb some energy is transferred. Then as the electrons pass through the second bulb, more energy is transferred. The same number of electrons pass along the circuit so the current is the same at all points in the circuit. In diagram (b) the current flows out of the cell around the circuit and splits between the two bulbs. The current is different in each bulb but the sum of the two currents = the current coming out of the battery. Not all metals are magnetic. Only iron, steel, nickel and cobalt are magnetic. magnetic field similar to that produced by a bar magnet. If you put a bar of iron inside the coil, it bahaves like a magnet - but only while the current is flowing. If the current is turned off, the bar stops being magnetic. What you have now is an electromagnet. An electromagnet is useful. The electric bell below uses an electromagnet to make it work. When the bell push, A, is closed, electric current can flow through the coil and the electromagnet, B, attracts the hammer, D.
Position. Another useful device using an electromagnet is a relay switch. Thus the resistance decreases. Let me explain this theory using energy bands: Semiconductors have a narrow forbidden band between the valence and conduction bands. At normal temperature, the thermal energy of some valenc electrons, is sufficient for them to reach the conduction band, where they may become conduction electrons. 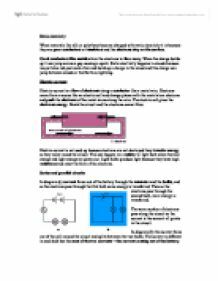 The semi conductors such as silicon or germanium are also non ohmic conductors. 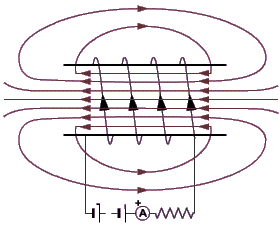 The semi conductors are again divided such as intrinsic and extrinsic. The graphs that are obtained from the various non ohmic conductors are as follows. Light Dependant Resistor B I+ A V- V+ I- This shows that the listed components are not ohmic conductors. Through a series of connection wires and crocodile clips the ammeter was joined to metre long piece of wire that was stripped at both ends. This was twisted around the horseshoe shaped iron as the coil, repeated with the relevant number of turns each time. Thus, causing the microscopic domains in the core to align with clear north and south poles and the core to become a magnet and attract the paperclips. So, if the current is lowered then so will the magnetic field be weaker and the fewer domains aligned hence a weaker magnet, hence less paperclips picked up. Most of the pins fell off, but some stayed on the core. First I counted how many pins stayed on the core when the power was off and then I counted how many pins had fallen off. By adding the two figures I could find out the total number of pins lifted by the electromagnet. BV YRBG Candle ROYGBV ROYGB V Filament ROYGBV YRBG V Red light R YORB Mercury V G O ROYG Natural light ROYGBIV ROYGBIV (1) Using the hand-held Spectroscope and the diffracting grate: Comparing natural light with the other light sources that I investigated above: Looking at my results above, for natural light from both, the spectra and the diffraction grating. Some devices let a large current through them. These devices have a low resistance to the flow of current. A device with a high resistance allows less current to flow through it when the same voltage is applied. Resistors pass a certain amount of current for a given voltage.